Color was an undeniable given in Berschback’s latest project: a 3,000-square-foot new build located in the historic 12 South neighborhood in Nashville. Known for its walkable streets and bungalow-style homes, the designer was first tasked with channeling Craftsman charm from scratch. Along with a serious vinyl collection, the homeowners had also scooped up a number of prints, paintings, and photographs over the years. Thus, it only seemed fitting that Berschback showcase the home’s inspired architectural character through the lens of art. With her clients soon to be empty nesters, the designer focused on cultivating a vibrant place cozy enough for two country music lovers to kick back and call home. Benjamin Moore’s tried-and-true paint swatch, White Dove, takes on new meaning in the living room where an optical piece by artist Gina Julian doubles as a spirited focal point over the mantel. “Most of the pieces in the house were done by friends or relatives, so the art was very personal to them. Knowing that we had these colors to work around, we wanted to keep the space clean and bring in fabrics and textures that would complement the artwork,” shares Berschback. One part music lounge, one part library, and one part home bar, Berschback’s clients were most excited about having a hangout space to call their own. The rich navy blue walls (swathed in Benjamin Moore’s Racoon Fur) amp up the moodiness for whiskey drinking, while an opposing chaise lounge made it a welcoming place to relax with a good read. With the exception of a painted British flag by Lynette Wright on one of the walls, the only pieces of art in the room are the husband’s favorite albums from high school and college, which Berschback had framed. Note: There’s not a television in sight—just good tunes. “Both the husband and wife have a connection to country music and the music business. The husband grew up in Detroit and had been a collector and connoisseur since he was in high school. This room was kind of a nod to the merging of country music, rock music, and music that came out of Detroit,” says the designer. To keep their vinyl collection in order, the husband commissioned woodworker Chris Munn to design a custom walnut cabinet that would re-create the feeling of sifting through albums in a record store. “We took this room that would have traditionally been used as an office and created a space where both of them could put their feet up and listen to music just the two of them or host six or eight people if they wanted to,” she adds. 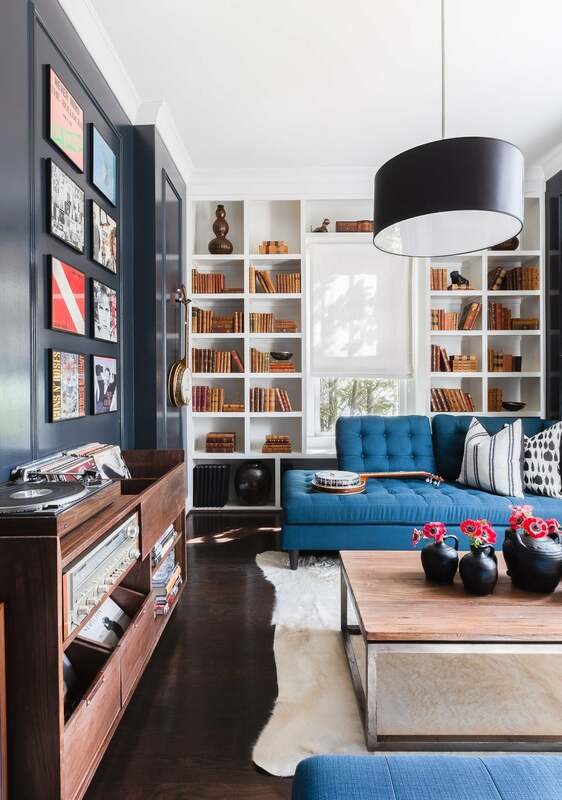 Black accents make a welcomed appearance in just about every room (all the interior doors in the house are even painted black). It’s a powerful hue Berschback swears by for a touch of luxe. In the breakfast room, the designer embraced black in a not-so-serious manner by pairing it with a fun texture on the chairs: velvet. Elsewhere, a skull painting by Sarah Skupien adds a special punch over the bar cart. In the more formal dining room, a glamorous chandelier from Jonathan Adler made up of glass hexagons presides over a round dining table. In this particular space, the designer was faced with the tricky task of making the room feel layered and alive with textures without tending toward dated. A similar color scheme is played out in the master bedroom where Sherwin-Williams’ Gauntlet Gray serves as a soothing backdrop and escape from the noise. We couldn’t name a better place to relax after a late night of listening to good music if we tried.